Transform your kitchen into a Tuscan eatery with panzanella. 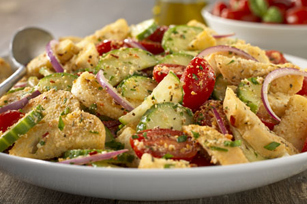 This Parmesan Panzanella Salad stars slices of French bread, garden vegetables and more. This side salad makes a great accompaniment to a serving of lean fish or poultry. Garnish with fresh basil leaves just before serving. Add 1/2 cup chopped fresh Italian parsley to salad before serving.